Faugheen gave Willie Mullins a sixth successive triumph in the BHP Insurances Irish Champion Hurdle with an emphatic performance at Leopardstown. After Hurricane Fly's five wins in the race, it was the turn of Faugheen (3-10 favourite) to strut his stuff ahead of his bid to repeat last year's victory in the Champion Hurdle at Cheltenham. Leading from flag-fall under Ruby Walsh, Faugheen was taken on at halfway by his stablemate Nichols Canyon, who had beaten him in the Morgiana Hurdle at Punchestown earlier in the campaign. However, a mistake at the second-last put paid to his chances and Faugheen went on to win as he liked by 15 lengths. The other Mullins runner, Arctic Fire, was second, with Nichols Canyon third. Walsh said: "Faugheen was explosive today. He travelled and jumped really well. We went at it from the word go - he jumped like a buck and he had them all killed off going to the second-last. "People have been moaning that he's been getting it handy it in front, well you saw what he did when they tried to take him on - he destroyed them altogether. "I viewed it that if Willie Mullins wasn't training Arctic Fire or Nichols Canyon, what would I do? That's the way I rode the race. "I was riding the Champion Hurdle horse and if they are going to beat me they are going to have to come and get me." Mullins said: "It was an electrifying performance and I don't think I've ever seen him jump so well. He only fluffed the last. When he had to jump alongside Nichols Canyon he was hugely accurate and very good. "They appeared to go a hell of a gallop all the way, and I couldn't ask for any more. "Arctic Fire ran a cracker, and probably up to last year's form. Nichols Canyon I would imagine was feeling the effects of his last race. I hoped for a bit more from him. "The two horses left themselves wide open, and Danny (Mullins) still hadn't gone for Arctic Fire coming to the last bend. 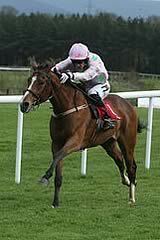 But he (Faugheen) just opened up again. It was a proper Irish Champion Hurdle." Delighted owner Rich Ricci was winning the race for the first time and said: "He jumped brilliantly, it was great - fantastic. "He was good, wasn't he? I thought he looked big again in the ring and there's improvement to come, I hope. "It was a good race, I'm delighted he won and roll on Cheltenham. To win by 15 lengths on this ground, at this racecourse, is brilliant. "You can't describe the performance anything other than that. Hopefully he brings the same form to Cheltenham." Bookmaker reaction was emphatic, with Ladbrokes going just 1-4 (from 1-2) about him retaining his crown at the Festival in March.